A package of Hormel’s Natural Choice salami in a refrigerated grocery case. Photo by the author. Last week, the Superior Court of the District of Columbia dismissed a lawsuit filed in 2016 by the Animal Legal Defense Fund (ALDF) against Hormel Foods Corporation. The suit alleged that Hormel misled customers with their “Natural Choice” meat packaging. Comforting “unbleached” brown paperboard and the promise of natural meat inside the box may have convinced customers looking for healthier, more ecologically friendly food that they were getting something other than what Hormel is selling. What’s the difference, and why does it matter? What does the claim of “natural meat” mean to you? A survey conducted by Consumer Reports in 2014 asked shoppers what they thought they were getting when they bought a package of what claimed to be natural meat. A majority of respondents expected a product without growth-promoting hormones, antibiotics, GMO-based feed, artificial ingredients or additives, and that the animals had room to roam. However, what consumers want to believe about the term “natural” is quite different from the meaning as used by food producers and processors. While Hormel’s director of marketing admitted that many consumers expect natural meat to be raised without antibiotics, the suit was tossed out of court because, really, all a “natural” product needs to be is free of artificial ingredients and minimally processed. That’s it. Broad legal and industry definitions for the term are why products like cheezy-puffs, creme-filled cookie treats, and peanut butter full of palm oil and sugar can be called “natural.” It’s why Hormel can use the same antibiotic- and hormone-injected, factory-farmed pigs whose hams are ground up into cans of Spam to be the main ingredient in their Natural Choice brand meat products. Companies like Hormel are not obligated to give customers what they might ethically expect, only what’s legal. 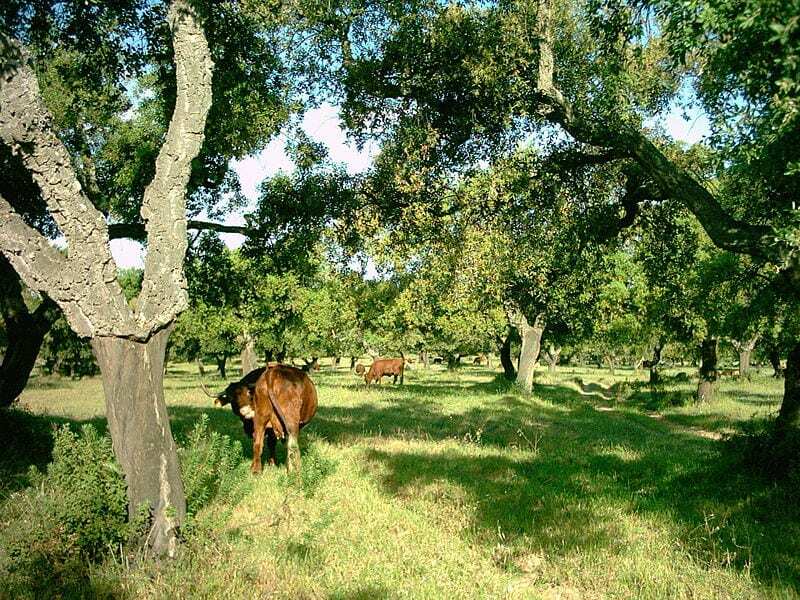 Dehesa, a Spanish/Portuguese system of agroforestry that produces meat as well as a diversity of other products like timber, mushrooms, wild game, honey, and cork. Image courtesy of Wikimedia Commons, CC BY-SA 2.5. Traditionally, animals raised as “default livestock” performed useful functions in agricultural communities, helping till the soil, fertilizing it with their waste, and making marginal land productive by turning human-inedible scraps, grasses and weeds into eggs and milk. Meat is an expensive food, resource-wise, which is why natural meat (in the more aspirational sense) is only available in certain seasons and in limited amounts. We pay that cost in one of three ways: by eating it only sparingly, by paying big money to eat it more often, or by externalizing the true cost onto animals, workers, and the environment. When we decided that meat should be available all the time, for low prices, in quantities vast enough that it could be eaten by nearly everyone at any meal, that’s when we said goodbye to truly natural meat, at least for the masses. The good news is that efforts to provide ethically sourced natural meat are not only taking off and scaling up, they are gaining ground (literally, by building topsoil). Unless the price tag stuck on the package of meat at the grocery store is the sole concern, we are right to condemn factory-raised livestock as an ethical and environmental disaster. However, when livestock are freed from their confinement in fetid industrial complexes and returned to diverse pastures, perhaps surrounded by trees, the results make Hormel’s efforts at natural meat, however legal, seem pallid by comparison.